On a cold and rainy Sunday, it was heavenly to draw my daughter K, just back from an almost three week trip to India for the international public health agency she works for. She becomes the latest face in the 101 Faces Project. K can't sit for me as often as my daughter C, but she also appeared here and here. You have to click on those 2005 thumbnails to see the complete sketches. 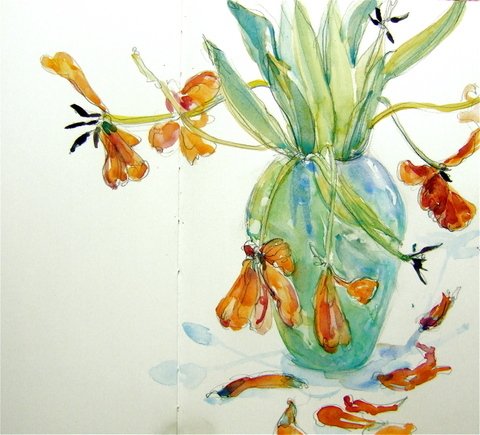 Yesterday morning, I sketched a vase of tulips in the kitchen. The flowers had seen better days, but the configuration of stem and fallen petals reminded me of one of those carnival rides in which the seats are on long spokes that go up and down way too fast. In a parallel, Scandinavian universe, Nina has recently posted a sketch of aged tulips. Hers look positively perky compared to mine! Great painting as usual. I am a fan of flowers and vases so I love the one you did. It's amazing, your mastery of the human face, so gracefully sculpted...even when it is such a small and distant figure which is even more phenomenal to me but perhaps you might not think so yourself as you seem to draw it with such easy as if it were a natural extension of yourself. Thank you so much, one and all! Chuck, I do remember your commenting on that drawing and I can't believe two years have passed, either! It's scary how fast life goes. Linda, I'd seen Nina's sketch and thought how fun that I'd been planning to do my dying tulips,too. Our versions couldn't be more different, do you think? Dee, I think it's a function of my standing while painting and of my still not being used to using the smallish sheets of my sketchbooks. I, of course, agree with those who said my daughter is beautiful, and I thank you for saying it ;D. Katherine, I haven't used reed pens in while. I have to add my voice to everyone elses, your daughter is very beautiful. 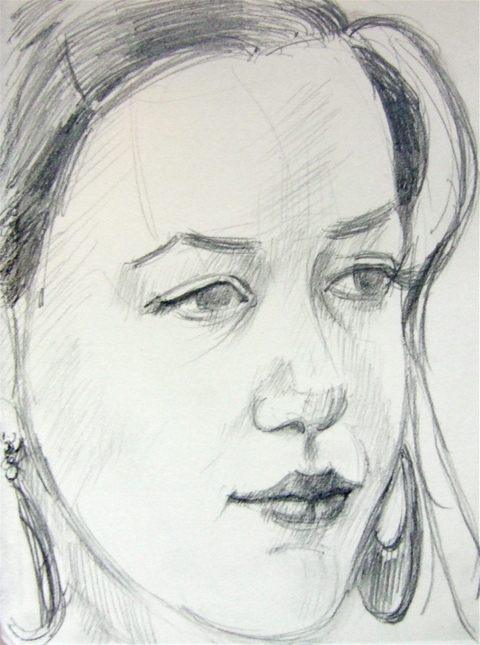 Your portraits have a lovely 'plump' quality about them (is that the right word?) I can really feel the curves and contours and you seem to manage this effortlessly! (Sigh!) I adore tulips, even when they are dropping petals they look so beautiful. Your style is more than a match to capture their beauty. Oh wow. I remember commenting on those first drawings of you daughters. Do you? Was that really 2005? Time is flying. I can see two more years in your daughter's face. That's a compliment to your drawing skills, not a comment about her age. Beautiful daughters you have there -- what a great mouth she has! I love the tulips and that wonderful cobalt turquoise vase; it is odd that you and Nina both did dying tulips!